Global kidney stones management market expected to generate revenue of around USD 2255.07 million by end of 2024, growing at a CAGR of around 4.33% between 2018 and 2024. The symptoms of kidney stone include intense pain in the side and/or groin, nausea, vomiting, blood in urine, and reduced urine output among others. The report covers forecast and analysis for the kidney stones management market on a global and regional level. The study provides historical data from 2015 along with a forecast from 2018 to 2024 based on revenue (USD Million). 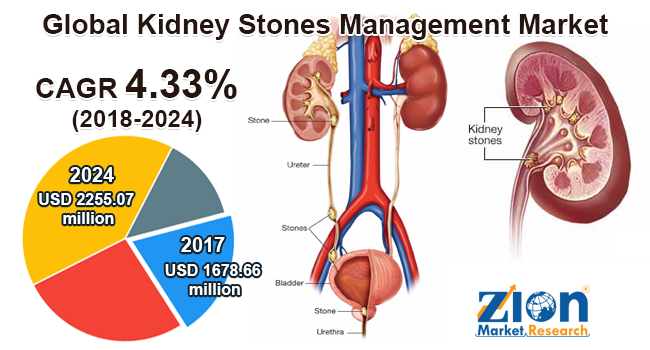 The study includes drivers and restraints for the kidney stones management market along with the impact they have on the demand over the forecast period. Additionally, the report includes the study of opportunities available in the kidney stones management market on a global as well as regional level. In order to give the users of this report a comprehensive view on the kidney stones management market, we have included competitive landscape and analysis of Porter’s Five Forces model for the market. The study encompasses a market attractiveness analysis, wherein all the segments are benchmarked based on their market size, growth rate, and general attractiveness. The report provides company market share analysis in order to give a broader overview of the key players in the kidney stones management market. In addition, the report also covers key strategic developments of the market including acquisitions & mergers, new diagnostics launch, agreements, partnerships, collaborations & joint ventures, research & development, regional expansion of major participants involved in the kidney stones management market on the global and regional basis. The study provides a decisive view on the kidney stones management market by segmenting the market based on diagnostics, type, treatment, and regions. The segments have been analyzed based on present and future trends and the market is estimated from 2018 to 2024. The diagnostics segment has been segmented into Computed Tomography Scan, Abdominal X-ray, Ultrasound, Intravenous Paleography, Abdominal MRI, and Others. Computed Tomography Scan segment holds the maximum share of the product segment owing to its high accuracy. Based on the type, kidney stones management market has been segmented into calcium oxalate, calcium phosphate, uric acid, struvite, cysteine. Calcium oxalate segment holds the maximum share of the type segment owing to its high incidence rate. Based on treatment, kidney stones management market has been segmented into extracorporeal shock wave lithotripsy, percutaneous nephrolithotomy, ureteroscopy, and others. The regional segmentation includes the current and forecast demand for North America, Europe, Asia Pacific, Latin America, and the Middle East & Africa with its further divided into major countries including the U.S. Canada, Germany, France, the UK, China, Japan, India, and Brazil. This segmentation includes demand for kidney stones management based on individual segment and applications in all the regions and countries. The report also includes detailed profiles of end players such as Coloplast Group, Bard Medical Division, Boston Scientific Corporation, Allengers Medical Systems, Cook Medical, Lumenis Ltd., Electro Medical Systems, Storz Medical AG, Richard Wolf GmbH, and Dornier Medtech, among others.